Folks, its a new year and the NFL playoffs are upon us! The 2019 Super Bowl is on 03 February 2019. 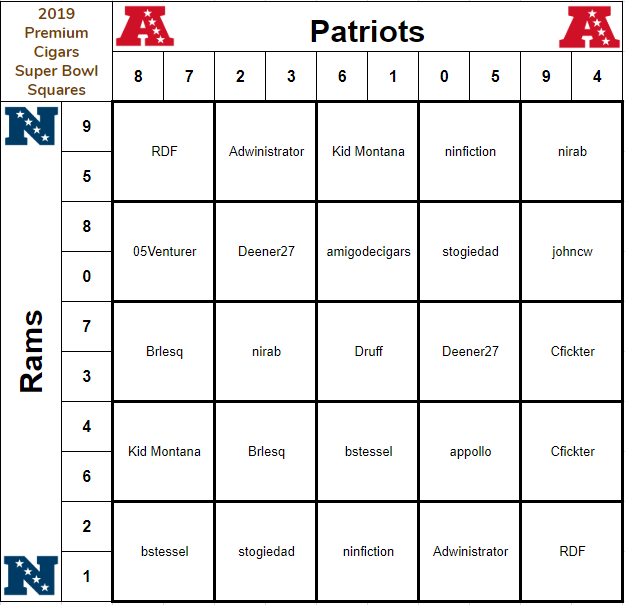 Following up the fine work done by nirab, sar127 and others in 2015 - 2018, I am kicking off the 2019 Premium Cigars Super Bowl Squares! The squares this year will be a 5x5 grid, for a total of 25 squares. Because it's a 5x5, each row and column will have two numbers randomly assigned numbers, picked by an online number generator. Per normal Super Bowl squares convention, winning numbers are the last digit of each team’s score. To enter, post in this thread with the number of the square you want to pick. You may initially pick up to two (2) squares. The 25th square and any other unclaimed squares will be available to claim after the 19th. The entry fee for each square is two premium cigars (see notes below on eligibility) for a total prize pool of 50 cigars. 10 cigars will be awarded to a lucky bastage at half time. 30 cigars will be awarded for the final score, and another 10 cigars for the reverse final numbers. 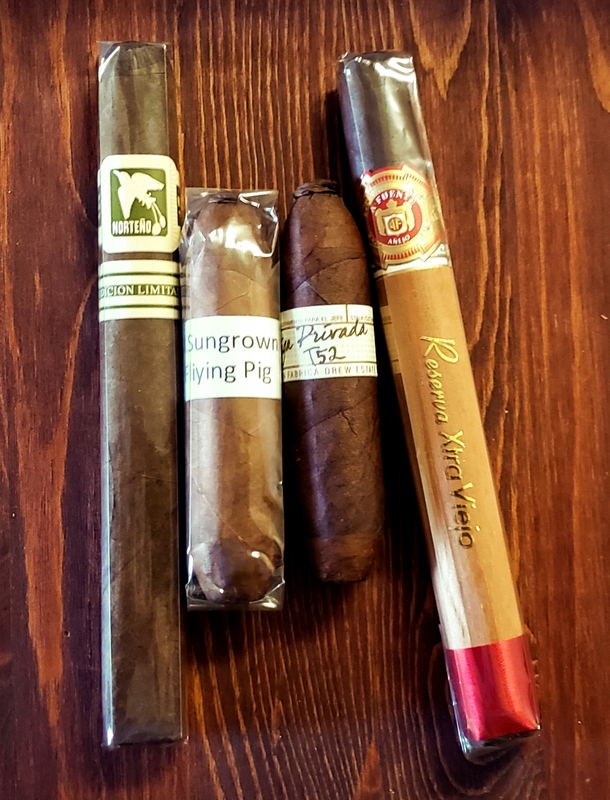 Instead of everybody sending in their cigars to me, participants must post a photo of their cigars to this thread within one week of picking the square, or risk losing the square. After all the boxes are claimed and the photos posted, I will provide a list of the cigars in each winning pack. After the game is over, I will message each person who they will be sending their parcel to. Each player will only need to ship one parcel, either to the overall winner or the halftime winner or the consolation winner. If you fail to mail by the deadline, you will be given neutral or negative feedback, depending on the circumstances; lets be courteous and not keep the winners waiting. Eligible cigars must be good s**t with an average retail price above $11/ea if purchased by the box. Verify prices any of the following sites: Holts, Famous Cigars, JR Cigars/Serious Cigars, Cigars International, Small Batch Cigar. Pricing from discount retailers, special sales, blowouts etc does not apply. If there is a question, ask, and we can come to an understanding collectively. General Tobacco and Altadis brands are permitted by exception (good s**t only). Cuban cigars, limited, out of production and no-longer for sale, significantly aged, or other notable cigars which don’t strictly meet the unit box price limit are allowed [Edit: up to] 25% premium to get over the $11 minimum. This contest is open to any Cigar Geek with Veteran status, in good standing, and who has been active within the last 6 months. If for any reason I ! @#%$ed up and need to edit the rules after the initial post, I will strike the revised content and use [edit:...] add the new terms [edit: Cigar Geeks doesn't seem to have a strike feature. I'll just delete it and add the new terms like this]. Now pick your squares, post your cigars, and lets DO THIS! Subject: RE: 2019 Premium Cigars Super Bowl Squares Contest - Accepting Participants! I will take squares 12 and 5 please! Thanks for doing this Dan!! Awesome! 9 and 22 for me. I will get a pic this weekend. Thanks for running! 11 and 17 please. Thanks for organizing this, Dan! I'll take 2 and 24. Thanks Dan! As a reminder to everyone, please post a photo of the cigars you will be sending. I will message you who you send them to after the contest is over. Also to help me out, include a text description of the cigars in your post. My sticks. 2 squares, 4 cigars. I'll take 19 if its still available. Subject: Re: 2019 Premium Cigars Super Bowl Squares Contest - two squares left! I'm going to see if I can come up witht cigars for the last square. Subject: Re: 2019 Premium Cigars Super Bowl Squares Contest - one square left! One square still unclaimed. Glad to see the new format so that we can fill it up this year.